Located adjacent to the magnificent Segerstrom Center for the Arts, the newly re-opened Center Club continues its tradition as one of Orange County’s most impressive private clubs. A multi-million dollar renovation has seen state-of-the-art ballroom facilities combined with sophisticated elegance, making it the perfect setting for your special day. The Center Club occupies the garden level of the performing arts complex, with a diverse selection of spaces to choose from which cater to both large and intimate wedding parties. A classical music theme resonates throughout the complex, with rooms named for Mozart, Chopin and Beethoven, while musical scores are worked into the hallway walls. The Symphony Ballroom is the Center Club’s most illustrious space, with three chambers creating an arrowhead shape and a dynamism in the architecture that creates connection, even during large-scale events of up to 250 guests. For smaller wedding parties you can opt for the Chopin Room, with a spacious outdoor terrace for ceremonies or cocktail hours and strong architectural elements that draw the eye. Along with the Mozart and Beethoven Rooms, it boasts floor-to-ceiling windows, with the latter two looking out across a stunning and tranquil water garden, designed by Modernist landscape architect, Peter Walker. Alternatively, there is the Zen-inspired Earth, Wind and Fire Rooms which are ideal for intimate wedding celebrations, or the stately VIP Encore Lounge, decked out in hardwoods and rich leather which make for elegant features in couple portraits. The modern architecture of the complex and diverse range of spaces allow for creative and captivating wedding photography. This is particularly true during nighttime portrait sessions around the Segerstrom Center for the Arts with its spectacular outdoor lighting. Wedding packages at the Center Club include on-site catering by their award-winning chef and culinary team, as well as outstanding service from their private event planners. There is plenty of opportunity to personalize the spaces with your own floral arrangements and decor, particularly within the bronze and rich gray interior of the Symphony Ballroom. 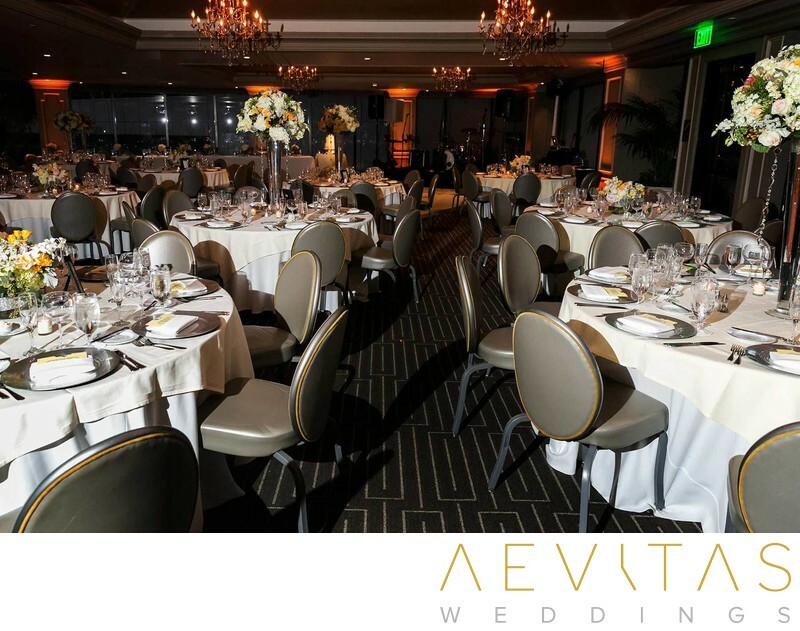 As its name suggests, the Center Club boasts a central location in Costa Mesa, making it convenient for you and your guests, and offering an abundance of upmarket Orange County hotels in the nearby surrounds to retire to at the end of your wedding night.